2015: A Summer of Blue | carpe diem! I’ve had a thing about indigo for longer than I care to remember. I think it started when my mother included indigo vats in a summer school dyeing class she taught in the early 1970s; in my mind’s eye I still see the shimmering metallic blue-copper-purple surface of the liquid and the cloth emerging from the vat green, turning deep indigo blue as I watched. Some years ago I started to recreate the magic. I began with the simplest chemical ‘colour run remover’ (I’ll explain these terms later) vat, and managed to dye some spinning fibre blue. I felted it too, but still: blue! I read of traditional fermentation vats and HAD to try to establish a sig vat based on the bacterial breakdown of urine. I briefly managed to get it working and saw a different blue, murkier and darker, on wool that 4 years later still retains the faint barnyard odour that for centuries indicated the finest blues. In 2013 my first attempt to grow Japanese indigo failed to thrive outside in a typical British summer, but I discovered that woad – the traditional blue of northern Europe – thrived. I wrote a blog post “Blue! 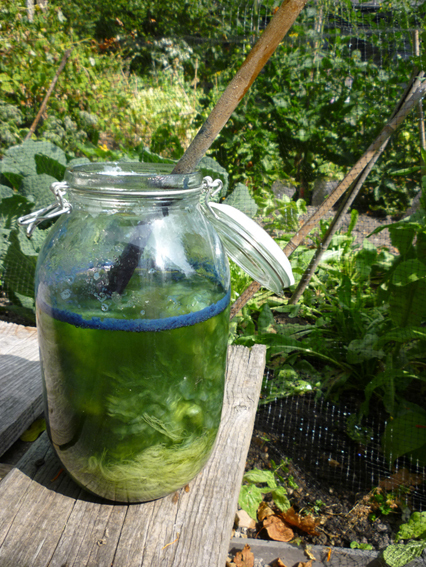 From leaves!” about the fun I had crushing the leaves and extracting the indigo to dye blue, then using the ‘waste’ leaf matter to dye a second completely different colour known as woad pink. The fabulous gift from A. of John Marshall’s new book on working with fresh indigo has inspired me to plan greater efforts this summer. Woad and the various plants known as ‘indigo’ that grow in warmer climates all contain the same compound – indigotin – that produces indigo blue, but woad contains less than most other indigos. I’ve made careful preparations. I want to try some of the interesting techniques that John describes; to be sure of them, I need fresh tadeai, the Japanese indigo Polygonum or Persicaria tinctoria. It won’t thrive in our semi-continental climate and clay soils; it requires a warmer maritime climate, higher humidity and reliable summer heat, and moist soil rich in organic matter. 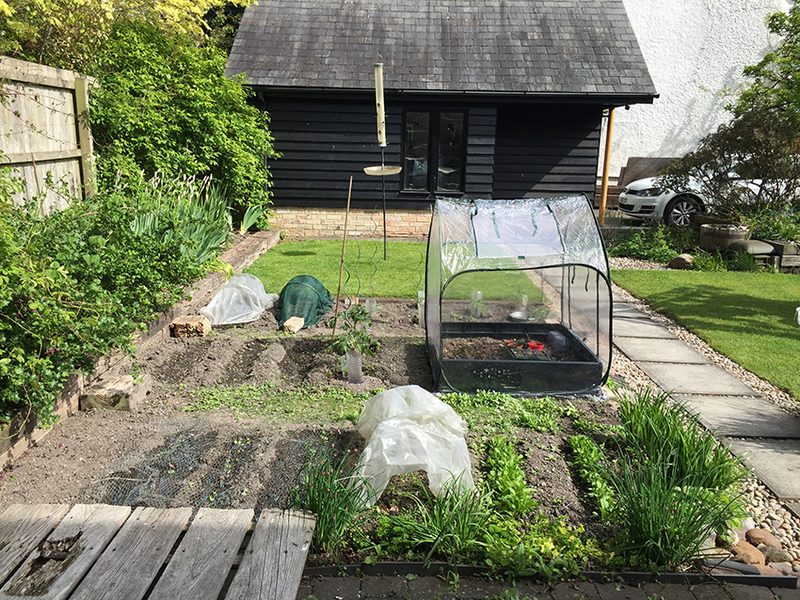 So I’ve bought a tiny greenhouse, the appropriate size for our tiny garden, complete with raised bed that I’ve filled with compost and leaf mould. I’m hoping this will allow me some control over heat and humidity. I sowed the tadeai seed that John Marshall kindly included with the book indoors in April, keeping the seed tray in the warmth upstairs next to my computer. I even repurposed my drawing desk light with a grow light bulb. And I’ve had some success! Now the tadeai seedling are hardening off in the greenhouse, and seem to be thriving. In theory woad leaves could be used for the same techniques, although the colours might be fainter. I need more woad! 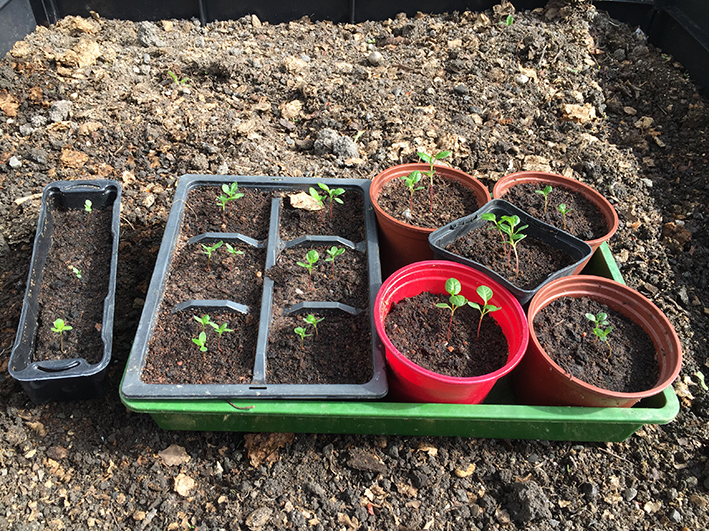 Sadly my first woad sowing either failed to germinate or, equally possible, the seedlings were eliminated by the horde of slugs and snails that reside in the garden. To the far left of the greenhouse there are three rows of woad re-sown a week ago, and I’m about to go outside to apply slug pellets and cover them to protect the birds and other animals. Fortunately there are other sources of woad in the UK. The Woad Centre in Norfolk has been growing and harvesting it for some years. They sell indigo pigment extracted from the leaves and a variety of other products, but I am most interested in their woad balls. For centuries woad was a valuable commercial crop, preserved and transported to dyers in the form of balls formed from the chopped and kneaded fresh leaves, then left to dry. The balls can be reconsitituted for various forms of indigo vat, including the same extraction process I used in 2013. I’m now more interested in the various forms of fermentation vats, and have begun to prepare for my first attempt by ‘couching’ 100g of woad ball. This entails crushing the balls as finely as possible, moistening the mass, and leaving it to rot down/ferment into a dark green-black mass which is then used in the dye vat. I haven’t yet come across any explanation of the reason for the couching process; my guess is that the fermentation breaks down cell walls to ensure more of the indigotin compound is available to the dyeing process. 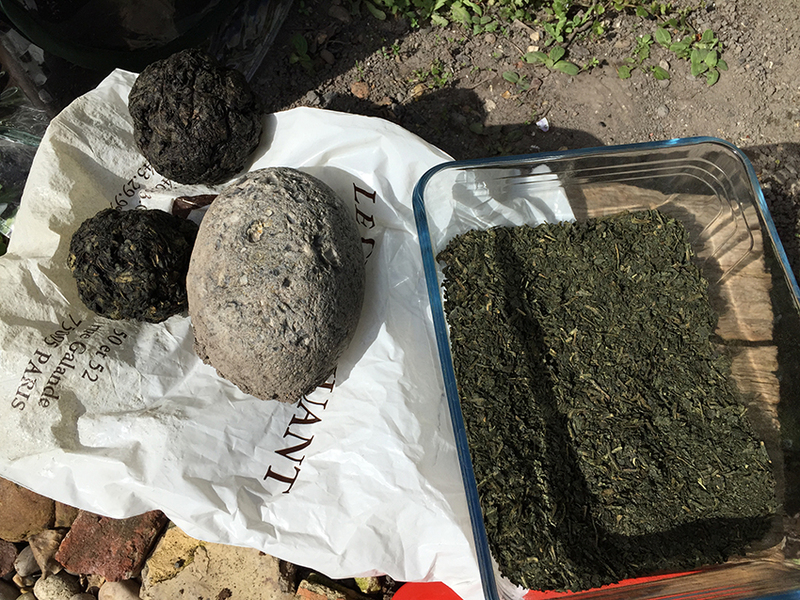 The crushed woad ball in that dish were prepared and wetted with rainwater two days ago and I’m very happy: the mass is darker and warm to the touch. It’s working! It has a strong odour, the smell from the centre of a pile of grass clippings, and that seems right. This entry was posted in Indigo and tagged dyeing, England, Handmade, Homegrown, SummerOfBlue on May 7, 2015 by sarahw. I am so excited to see what comes from the Summer of Blue!!!! How exciting! And a baby greenhouse specially for indigo. I have woad seeds that are sort of germinating, but not very enthusiastically. No greenhouse on the allotment yet.